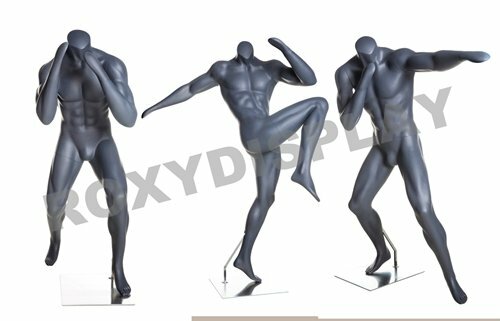 (MZ-BOXING-GROUP) Eye Catching Male Headless Mannequin, Athletic Style. Boxing pose. MZ-BOXING-1, MZ-BOXING-2, MZ-BOXING-3. Eye Catching Male Headless Mannequin, Athletic Style. Boxing pose. Color: Matte Grey. Material: Fiberglass Including square metal base. With Calf and foot support. Feature: detachable arms, left and right leg, hands and torso for easy dressing. Not include clothes. MZ-BOXING-GROUP 3 Mannequins group. Eye Catching Male Headless Mannequin, Athletic Style. Boxing pose. MZ-BOXING-1, MZ-BOXING-2, MZ-BOXING-3. Feature: detachable arms, left and right leg, hands and torso for easy dressing. Including square metal base. With Calf and foot support. Not include clothes. View More In Mannequins & Clothing Forms. If you have any questions about this product by Roxy Display, contact us by completing and submitting the form below. If you are looking for a specif part number, please include it with your message.